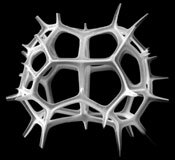 Radiolaria are protozoa distinguished 1) by segregation of their soft anatomy into the central capsule, containing the endoplasm, and the surrounding ectoplasm (or calymma), and 2) by their siliceous (opaline) skeletons of the large majority of species. 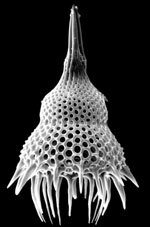 Radiolarians have existed since the beginning of the Paleozoic era, producing an astonishing diversity of intricate shapes during their 600 million year history. They take their name from the radial symmetry, often marked by radial skeletal spines, characteristic of many forms. Nevertheless, many other forms lack such radial symmetry. Skeletal elements of radiolarians, even the radially symmetrical ones, do not actually meet at the center of the organism. This distinguishes them from the superficially similar skeletons of acantharians, which are composed of celestite rather than opal. The central capsule is enclosed in a membrane. It contains not only the nucleus but mitochondria (respiratory organelles) and Golgi bodies (secretory organelles), as well as vacuoles, lipid droplets, and food reserves. Reproduction, respiration, and biochemical synthesis are functions carried out in the central capsule. Communication to the calymma is through pores in the membrane. Conspicuous features of the calymma are the frothy, bubble-like alveoli. The alveoli are presumably a floatation device, disappearing when agitated and reforming after the individual has sunk to a greater depth. Also to be found are mitochondria (fewer than in the central capsule), digestive vacuoles, and algal symbionts. The ectoplasm extends into a complex network of pseudopodia, including irregular rhizopodia, radial axopodia (stiffened by axial rods), and delicate filpodia. Pseudopodia surround the projecting skeletal spines, protecting them from dissolution in sea water. The pseudopods may be quite active, capturing prey and disposing of wastes, and reacting to external stimuli. They are able to cling to and move the individual about surfaces of laboratory vessels, and may thus cling to foreign objects in nature. But so far attachment has not been observed in nature, and there are no known benthonic forms. Digestion and waste disposal functions occur in the ectoplasm. 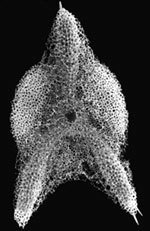 Individual radiolarians are normally in the size range of hundredths to tenths of millimeters, but some reach dimensions of a millimeter or more, large enough to be seen with the naked eye. Some species are amassed into colonies, which may reach sizes of centimeter and even meter scale. Radiolarians are part of the marine plankton. They occur in all oceans, including shallow seas, bays, fjords, etc., but almost invariably at salinities above 30 parts per thousand (slightly lower than normal marine values). They are most abundant in the upper few hundred meters of the open oceans, but have been reported at all depths, including deep trenches of the Pacific, with different species often inhabiting different depth horizons. Surface and subsurface geographic distributions of species are influenced by ocean climatic variables, with biogeographic provinces characteristically mirroring surface and subsurface water masses. 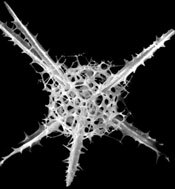 The classification of Radiolaria recognizes two major extant groups: 1) the polycystines, with solid skeletal elements of simple opaline silica, and 2) the Phaeodarians, with hollow skeletal elements of a complex (and as yet poorly understood) siliceous composition that results in rapid dissolution in sea water and consequent rare preservation in sediments. The Phaeodarians also possess a unique anatomical feature, a mass of tiny pigmented particles called the phaeodium. The polycystines, which are the radiolarians best known to geologists, are subdivided into two major groups: the basically spherical-shelled Spumellaria, and the basically conical-shelled Nassellaria. A few polycystine groups lack a skeleton altogether. Characteristics of the central capsular membrane also distinguish these major divisions of the Radiolaria. Some major groups of extinct radiolarians differ substantially from both Spumellaria and Nassellaria, and may be ranked at the same taxonomic level as those groups (see links to Mesozoic and Paleozoic radiolarians). Spumellarians come in various shapes ranging from spherical to ellipsoidal to discoidal. These are the ones typically with radial symmetry. It is common for the Spumellarians to have several concentric shells connected by radial bars. The colonial radiolarians are spumellarians, some with spherical shells and others whose skeletons are instead an association of loose rods, and yet others without skeletons. Nassellarian shapes derive from geometrically simple spicules (resembling saw horses, "D"-shaped rings, and the like) to which are added (from taxa to taxa) latticed cover to form a chamber, then additional chambers expanding axially into the conical forms typical of the group. Reproduction of radiolarians is poorly known. Binary fission, multiple fission, and budding have been reported. Sexual reproduction is suggested by observations of numerous biflagellated swarmers, similar to cells known to serve a reproductive function in other protistan groups. But the subsequent fate of these bodies has yet to be observed. Nutrition of radiolarians involves a large variety of materials, including many zooplankton groups such as copepods, crustacean larvae, ciliates, and flagellates, and such phytoplankton groups as diatoms, coccolithophores, and dinoflagellates. They may also consume bacteria and organic detritus. Algal symbionts play an important role in at least the polycystines, not only for the nutrition of the host, but also for primary production of the area. Experimental evidence shows that organic carbon fixed by algae is assimilated by the radiolarian host. Fascinating schemes have been observed in which the symbionts spread far out in pseudopodial networks during daylight and are retracted at night.